CHICAGO (jGLi) – The Bikol U.S.A. of the Midwest led by its President Evelyn R. Tolledo joined Friday (Nov. 11) a dinner-dance fundraiser for the victims of typhoons and floods in Bikol region and Laguna province in the Philippines at Elk’s Club at 495 Lee St. in suburban Des Plaines, Illinois. Money raised will also be used for the completion of the Divine Mercy Shrine and Carmelite Monastery of the Carmelite Nuns of the Holy Trinity (CNHT) in Kawakawa, Ligao City in Albay province. Rev. Mother Maria Trinidad P. Bunac, CNHT Prioress General, said that part of the proceeds would also go to scholarship program of some poor and deserving students. She said so far the program has graduated two nurses, one of whom had just passed the nursing board at first attempt while another other is reviewing for the board. Part of the proceeds will also be earmarked for treatment of some children with hydrocephalous medical condition. 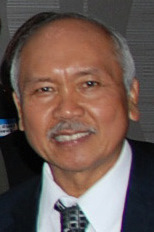 Ligao native Romy Badiola, CEO of RC Trading and charter president of the Ligawenos of the Midwest which became Bikol U.S.A. in Chicago, appealed to the guests and his fellow Bikolanos to help CNHT in its fundraising. Rev. Fr. Peter Caposo, associate pastor of St. Peter’s Church in Skokie, Illinois, led the invocation during the event. Mother Trinidad Bunac thanked donors, who went out of their way, to buy dinner tickets while others sent in their donations. 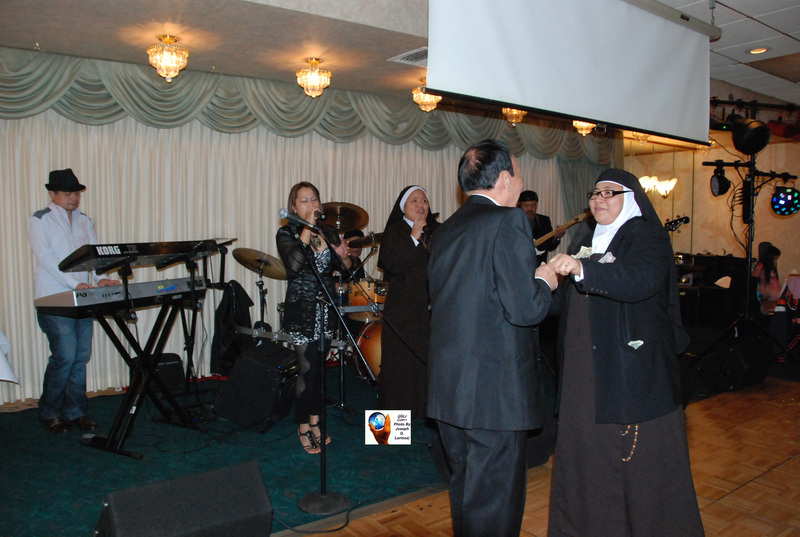 John Arcilla and the Trio Carmelite Nuns also serenaded the guests while Anita Rosa, Ronald Zapata and Sister Maryjohn L. Mendones, CNHT, performed exhibition numbers. Ria and Josephine Bonjoc played violin and guitar while Espie Nguyen and Danny Garcia acted as the masters of ceremony. Boy Bonjoc and Company provided the music and the band. Those invited by Evelyn Tolledo chipped in half of the $50.00 dinner ticket to fund-raising event. Among those invited by Ms. Tolledo to the fund-raiser were her husband Roberto Tolledo, Joseph G. Lariosa, G. Jun Delfin, President/Director of the Unlimited Agency, Inc. based in Naperville, Illinois, Bob Sioson, Hyde Sombilla, Tom Held and his wife, Letty “Nene” Servino-Held, first President of Bikol U.S.A. Romy Badiola and his friend, Heidi Lim. The Bikol USA of the Midwest also donated $300.00 from its own fund. Those who did not attend but still sent in their donations are as follows: Aida and Rick Joseph and Virginia Ordonez in the amount of $50.00; Alice Llames, $50.00; Dulce Oreta and Efren Sarmiento, $50.00; Teresita Catorce and Lettecia Cope Costales, $50.00; Emelita and Jess Mante, $50.00; Alegria and Jay Bacerdo, $50.00; for a grand total of $600.00. “Sister Trinidad will be sending us the letter of acknowledgement and the receipt of these donations.” Ms. Tolledo added. Rev. Mother Ma. Trinidad P. Bunac of the Carmelite Nuns of the Holy Trinity (CNHT) of Kawakawa, Ligao City in Albay province in the Philippines obliges Ligao City native and charter Bikol U.S.A. President Romy Badiola to a dance after Mr. Badiola pinned dollar bills on her habit during the fund-raising at the Elk’s Club at 495 Lee St. in suburban Des Plaines, Illinois last Friday, Nov. 11. At left are Sister Maryjohn L. Mendones, CNHT, Josephine Bonjoc and other members of the Boy Bonjoc band. Part of the money raised will go to the completion of the Divine Mercy Shrine, Carmelite Monastery, victims of typhoons and floods in Bikol region and Laguna province. Evelyn Tolledo, president of the Bikol U.S.A. of the Midwest donated $300.00 from the fund of the club and invited other members of the club and friends to donate to round out a total donation of $600.00.